CannabisNewsWire Editorial Coverage: Cultivation by both large and small growers is powering growth across the cannabis industry. When economic historians look back on the early 21st century, the cannabis industry will likely feature prominently in conversations. The industry, which has operated in the black market since the turn of the millennium, has grown to a revenue cap of over $9 billion in the United States alone, with an expected value of $47.3 billion by 2027. From retail outlets to research groups, edibles, technology, vaping liquids to health supplements, cannabis has become a diverse and powerful industry. Underlying it all is cultivation. As much the work of craft businesses as of big corporations, cultivation supplies the plants without which none of the rest would be possible. Licensed growers are providing the materials needed to drag cannabis profits away from funding crime and turning them into a legal, taxable, sustainable industry. 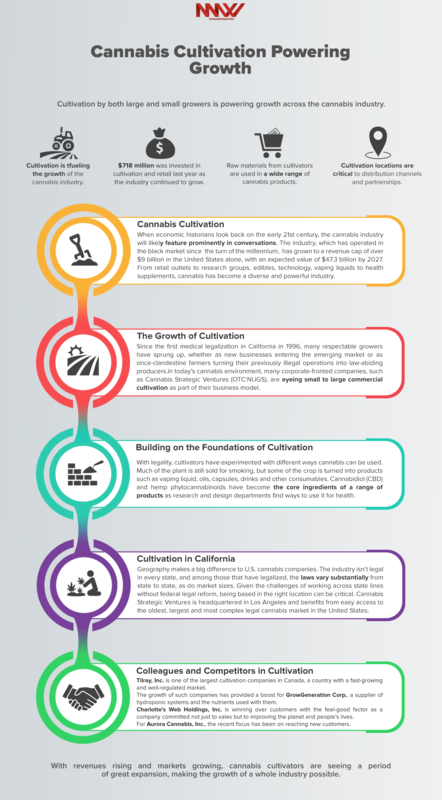 Cultivators make the cannabis industry possible. Cannabis cultivation is hardly a new activity in the United States, but a legal, corporate-fronted version of it is. Since the first medical legalization in California in 1996, many respectable growers have sprung up, whether as new businesses entering the emerging market or as once-clandestine farmers turning their previously illegal operations into law-abiding producers. In today’s cannabis environment, many corporate-fronted companies, such as Cannabis Strategic Ventures (OTC: NUGS), are eyeing small to large commercial cultivation as part of their business model. This interest of Cannabis Strategic Ventures shows how quickly cannabis cultivation has acquired the trappings of a legally established industry. As a publicly traded company that incubates, develops and partners with brands, Cannabis Strategic Ventures is a sort of meta-business that emerges in sophisticated markets — bolstering the development of production, services and retail through its application of business acumen and strategically applied capital. It’s not surprising that such companies are engaging with cannabis cultivation. Investment in cannabis cultivation and retail reached $718 million last year as investors were increasingly drawn to this growing and profitable market. Looking ahead, the trend shows no sign of declining. Cannabis cultivation is a specialist form of agriculture, requiring an understanding of hydroponics, plant strains and environmental factors that affect the potency of crops. Acquiring those skills hasn’t been easy, especially given how long the industry operated in the shadows, its techniques and collective knowledge shared only through illicit channels. As cultivation takes off, the industry needs the support of companies such as Cannabis Strategic Ventures to acquire equipment, train staff and build facilities to meet the demand of a growing customer base. Cultivation is fundamental to the market, so the sector is a natural target for investors looking to ensure a lasting place in the cannabis industry. Cannabis Strategic Ventures is actively seeking out cultivation facilities with existing infrastructure to speed up its move into cultivation. This initial step provides a foundation upon which much bigger moves can be built. Growers aren’t just selling the plants as the dried or refined forms of cannabis that users have been consuming for decades. With legality, cultivators have experimented with different ways cannabis can be used. Much of the plant is still sold for smoking, but some of the valuable crop is turned into products such as vaping liquid, oils, capsules, drinks and other consumables. Cannabidiol (CBD) and hemp phytocannabinoids, nonpsychoactive chemicals that appears in cannabis alongside the high-inducing THC, have become the core ingredient of a range of products as research and design departments find ways to use it for health, well-being and relaxation. The range of brands in the Cannabis Strategic Ventures portfolio reflects this varied approach to cannabis and its derivatives through commitments in category leaders in the space. None of these brands would be possible without the cultivation of cannabis plants. Bringing cultivation under the same umbrella as the products will offer opportunities for improved efficiency and profitability. By sourcing cannabis from its own facilities, Cannabis Strategic Ventures should be able to achieve vertical integration in the supply chain, which naturally leads to greater certainty over the supply of raw materials and increased efficiencies into the system, likely cutting costs and improving the timeline from cultivation to shelf. The growth of cannabis cultivation has led to a boom for support services as well, such as the provision of staff and hydroponic equipment. Here, too, efficiencies can be realized through vertical integration as cultivators work more closely with their suppliers. This is yet another way Cannabis Strategic Ventures may benefit if cultivation is brought in-house. As the owner of BudHire, a subsidiary specializing in cannabis industry recruitment, the company looks to be in an ideal position to source the most skilled staff for its facilities. Geography makes a big difference to U.S. cannabis companies. The industry isn’t legal in every state, and among those that have legalized, the laws vary substantially from state to state, as do market sizes. Given the challenges of working across state lines without federal legal reform, being based in the right location can be critical. Cannabis Strategic Ventures is headquartered in Los Angeles and benefits from easy access to the oldest, largest and most complex legal cannabis market in the United States. Many growers in California are now trying to transition from the black market to the legal one, but the move can be challenging. Volumes of cannabis that could have been sold for $3,000 illegally go for a fifth of that price now. Growers must pay taxes and work within well-defined regulations. Working with firms such as Cannabis Strategic Ventures, which offers essential financial and intellectual capital, can help a grower make the transition more successfully. Being located in California, therefore, provides two significant advantages for a company such as Cannabis Strategic Ventures. On one hand, the state has a large consumer base for the company’s products and services. On the other hand, it has a plentiful supply of small companies looking for financial support, creating opportunities for growth through mergers, acquisitions and partnerships. Cannabis Strategic Ventures is not alone in its interest in this promising industry. An impressive variety of companies are now cultivating cannabis. Tilray, Inc. (NASDAQ: TLRY) is one of the largest cultivation companies in Canada, a country with a fast-growing and well-regulated market. A global pioneer in production, distribution and research in the cannabis market, Tilray was the first licensed producer of medical cannabis in the world to have its facility Good Manufacturing Practices (GMP)-certified in accordance with European Medicine Agency (EMA) standards. Its recent earnings report reflected the extraordinary growth being experienced by well-run cannabis companies, with an 85 percent rise in revenue in the third quarter and a 78.9 percent rise for the year to date. With recreational cannabis having just become legal in Canada, this growth is likely to continue that increase over the next few years. The growth of such companies has provided a boost for GrowGeneration Corp. (OTCQX: GRWG), a supplier of hydroponic systems and the nutrients used with them. Like Cannabis Strategic Ventures, GrowGeneration has been acquiring other companies to expand its presence within the market. It also has an eye on reaching different market sectors. The company recently established the GrowGeneration Hemp Corp subsidiary to market its products to hemp farms and GrowGeneration Canada to sell to Canadian cultivators. In this booming market, branding is crucial to help companies stand out from the pack. Charlotte’s Web Holdings, Inc. (OTCQX: CWBHF) (CSE: CWEB) is winning over customers with the feel-good factor as a company committed not just to sales but to improving the planet and people’s lives. Given the correlation between cannabis use and liberal values, adopting such a strong identity seems to be bringing the company success. For Aurora Cannabis, Inc. (NYSE: ACB) (TSX: ACB), the recent focus has been on reaching new customers. As a Canadian company, Aurora is looking to profit from the country’s legalization of recreational cannabis in mid-October this year. The market is regulated on a regional basis, so Aurora has been busy setting up agreements with local authorities to give it a strong reach across the country and even stretching into international markets. With revenues rising and markets growing, cannabis cultivators are seeing a period of great expansion, making the growth of a whole industry possible.